Prishtina Center Hostel & Apartments, is located at the center of Kosovo’s capital city, Prishtina, from which it takes its name, with Swiss Diamond Hotel being on the opposite side at the Mother Theresa Boulevard. You’re able to see the National Theater of Kosovo from our terrace, also in really short distance you can visit some of the monumental buildings of our town such as the National Library, the City Art Gallery, the ethnological museum and the Symbol of independence “Newborn”, by walk. You can also enjoy some fresh air and a great view in our City Park. If you’re looking for some fun there are taverns like Miqt, Baron, Tirona and Ner’re. If you’re looking for something more exciting there are night clubs like “Duplex”, “13 Rooftop”, “Zone Club” which are the best nightlife places to be. There are many restaurants near our hostel where you can taste the best local food and other specialties. From all rooms you have access to balcony with a view of the city center (Mother Theresa Boulevard). A common room is available to all guests for relaxing and socializing, while you can watch a Satellite TV (available for watching all games on full HD). If you want to cook your own food, there you have a fully equipped kitchen at your disposal. Other facilities including, Free Internet Access (WiFi), free coffee and tea, Lockers, Fridge, Microwave, Washing and Drying machine for hire, iron, hair dryer and air conditioner. Our hostel will offer to all guests Free City Maps. Breakfast included, Tea & Coffee is free. Prishtina Center Apartment is a unit belonging to Prishtina Center Hostel which can accommodate groups ranging from 1 person to 4 people. The apartment is conveniently located in the city center with fantastic views of Zahir Pajaziti Square from the 3rd floor. The distance from the Apartment to the Hostel (which is located directly opposite the Grand Hotel) is 350 meters away. The apartment has been recently renovated and has a large, single bedroom containing a double bed, a bunk bed, a work table, chairs, and large, secure storage space. From the bedroom you have access to a balcony with great views of Prishtina city center - the perfect place to have your morning coffee! There is a living room with a multi-functional sofa that folds out into a bed if desired and attached to the living room is a fully equipped kitchen kitchen with a fridge, microwave, and oven. The bathroom is of a very clean and modern standard. Other facilities include Free WiFi Internet access, a TV, an iron, a hair dryer, and fresh towels. Please not that shoes must be removed before entering the apartment and that smoking inside is not permitted. Great location, friendly staff and cosy room. I would recommend it. Very nice place, lovely people. Perfect the staff is friendly and the location is great. C'était le feuuuuuu ! Juste génial, on peut pas trouver meilleure localisation, les chambres donnent sur la rue principale de Pristina. L'intérieur est moderne avec tout l'équipement nécessaire. Mais l'atout de l'Hostel reste le personnel et l'ambiance. On a joué au Uno et regardé la coupe du monde ensemble c'était super. On se sent vraiment à l'aise, comme avec des amis que l'on connait depuis longtemps. De plus, ils nous conseillent sur les différents lieux à visiter. On s'est bien marré. 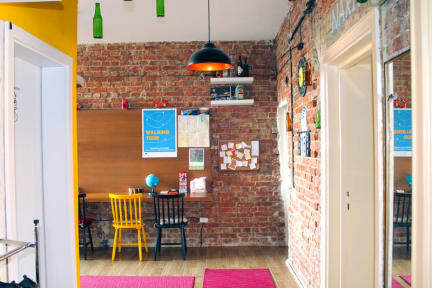 Un excellent séjour à Prishtina dans ce magnifique hostel. La localisation est parfaite, le personnel agréable et toujours à votre écoute, des lits confortables ... Quoi de mieux pour passer un bon moment au Kosovo? L'hostel est bien situé proche des principaux points d'intérêt de pristina. Le petit déjeuner est simple mais correct. A noter pour info qu'il est situé au 4eme étage sans ascenseur. I had a real good time at Prishtina Center Hostel. The location is perfect, the staff is nice and helpful. This is a small hostel with everything you need. I recommand it, I would return to this place without hesitation. People of Kosovo is real nice! I really enjoyed my stay in this hostel. The blond girl at the reception was very friendly, responsive and helpful. She was always trying to help or to find a solution. I definitely recommend this place. I will come back to that place with pleasure.